Panasonic Viera Connect TVs to get BBC Sport app | What Hi-Fi? 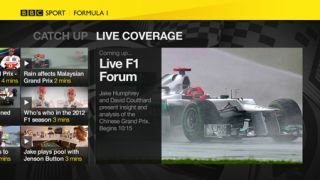 Panasonic's cloud-based Viera Connect internet TV service will get the new BBC Sport app in time for Wimbledon and the Olympics. The app, available this month, will be available on 24 of the company's 2011 and 2012 plasma and LCD Viera Connect televisions, from 32in to 65in. It will enable viewers to watch live and on-demand coverage from the BBC of some of the biggest sporting events this summer, including F1, Euro 2102, Wimbledon and the Olympics. You'll be able to switch between 24 simultaneous live streams, as well as access 2500 hours of BBC coverage, all in high definition, and retrieve additional data and statistics.